Ian McRae’s name is synonymous with ESCOM/Eskom, both old and the new. This is a fitting tribute to one who has devoted 47 years to the Corporation. Starting as an apprentice fitter in 1947 he was a second generation of McRae’s to work for ESCOM. He obtained his degree in 1953 after receiving the first Eskom Bursary to be awarded to an employee. He rose steadily through the ranks and has been closely involved with many important areas of development, particularly in the field of power generation. He is one of the foremost business leaders in country and was actively working to bring electricity to all South Africa’s people, to use energy as an agent for peace, and to create an organisation which is both productive and respectful and developing all its people. His strength within ESCOM apart from his technical knowledge has always been his popularity as a leader at all levels and his genuine interest in the people who worked for him. He became a world figure in electricity matters and his personal charm and integrity played no small part in the creation and promulgation of the new vision and the new identity which the Corporation was evolving. He saw Eskom as a catalyst in bringing electricity to the millions of South Africans who are deprived of this essential commodity. Ian McRae became the first Chief Executive of Eskom and Chairman of the Management Board on 19 June 1985. In May 1989 he was a signatory to the WANO (World Association of Nuclear Operators) charter in Moscow, thus making Eskom a full member of WANO. He was also Chairman of the South African National Committee of the World Energy Conference. The South African Institute of Mechanical Engineers awarded McRae the 1988 Engineering Newsmaker of the Year Award, in recognition of the contribution which he had made as engineer to the welfare of industry and society in Southern Africa. In November 1989 he was made an Honorary Fellow of the South African Institute of Measurement and Control. On 12 December 1989 the University of the Witwatersrand awarded him an Honorary Doctorate in Engineering in recognition of his efforts in the economic upliftment of South Africa and its neighbouring states, and the improvement of the quality of life for the peoples of Southern Africa. He had devoted more than 40 years to Eskom, starting as an apprentice fitter in 1947. He rose steadily through the ranks and had been closely involved with many important areas of development, particularly in the field of power generation. Mc Rae is one of the foremost business leaders in the country and was nominated by the Sunday Times Business Times as one of the top five businessmen of 1989. Ian McRae was elected by the Sunday Times as one of the Top 5 businessmen for 1989 and received this honour at a banquet held on 27 November 1989, and in May 1990 he received the 1989-90 Communication and leadership Award, South Africa from Toastmasters International, District 74. On 25 October 1990 Ian McRae received the Human Resources Man of the Year Award presented to him by joint sponsors, Human Resource Management Magazine and P-E Corporate Services at a banquet held in Johannesburg. On March 13, 1991 the College of Engineers of the Society of Professional Engineers (SPE) awarded Ian McRae Fellowship of the College in recognition of the contribution he had made to the Society of Professional Engineers. Ian McRae was awarded the Honorary Fellowship of the Institution of Nuclear Engineers in June 1991 by the Institution of Nuclear Engineers for his contribution to Nuclear Engineers in RSA. On 1 August 1991 the Harvard Business School Club of South Africa awarded Ian McRae the Business Statesman of the Year Award in recognition of his outstanding contribution to the economy of the Southern Africa and the welfare of its people. April 1992 saw McRae recognised as the Engineer of the Year by the Society of Professional Engineers. The citation pointed to his many achievements which enhanced the standing of the engineering profession. On 26 June 1992 the South African Institution of Mechanical Engineers awarded Ian McRae the 1991 Gold Medal Award for his significant contribution to the profession of Mechanical Engineering. He also received recognition for his service as Honorary President for the years 1990-1992. In March 1993 the South African Engineering Association honoured Ian McRae with the South African Institute of Engineers (SAVI) award in recognition of his singular contribution to the promotion of technology in South Africa. During the World Association Nuclear Operators’ (WANO) Biennial General Meeting held in Tokyo in April 1993, McRae was appointed President for a period of 2 years. On 1 September 1993 Dr McRae was awarded the 1993 Business Achievement Award by Business Day in recognition of the imaginative way in which they had responded to adversity and marketed electricity. They had transcended politics and won the confidence of both the local community as well as millions of potential customers in neighbouring countries. Their vision has led Eskom to initiate a sub-Saharan grid which would link South Africa to seventeen countries. The local electrification programme is South Africa’s largest community project. The success of this effort is already evident but the ultimate rewards would be a better quality of life for all South Africans. The odds of my going into a career of 50 years in the electricity supply industry of South Africa were very good. I was born into a Victoria Falls Power Company (VFP) residential property at Simmerpan in Germiston on 24 September 1929. VFP had been established as a private company, primarily to transmit power from the Victoria Falls down to the Reef. The technology was not available at that time and, due to the long distances, was not viable. The VFP then proceeded to build coal-fired power stations along the gold reef – the Witwatersrand. Some of the houses in the area where I was born still stand today, even though the power station has long been replaced by ESCOM’s National Control Centre and other departments. When I was a child, he took me with him on many occasions on callouts for some routine activities when safety was not an issue. I experienced steam-blowing, fires in the boilers, ash loading and dumping, the hum of turbines, the hum of high voltage transformers, electricity control rooms with meters and gauges, workshops and stores etc. Maybe this directed my later decision to join the VFP because I already felt at home in that environment. For me “property life” was good. I had a balanced childhood – making many friends among the other boys and girls living there. Virtually all have remained good friends throughout my life. We had access to a football field, to tennis courts and bowling greens, other recreation facilities, and of course, the Germiston Lake where we spent many days swimming. One of my early lessons about life was from a black grounds man, called “Dummy” (because he was both deaf and dumb). When I was old enough to realise his serious affliction, I was very concerned about this. But then I noticed that he smiled a lot and always gave everyone a joyous welcome with his broad grin, hand waving and grunts. He made me happy to meet him. He was always so willing to help us with making the tennis courts and putting up nets when we wished to play, so that we also would be happy. For years, I would think Dummy as a role model of how to deal with adversity, spread happiness and be happy oneself. One the property, I came into contact with some of the department heads of the VFP who played a major role in shaping that well-run company, on which the coal mining and other industries relied. This was important for building our economy and the nation. In Bill Fenwick, later to become head of operations, John McKenzie and Doug Fotheringham, head of system operations, I saw dedication and integrity, and the kind of men I could follow. On leaving school, I did not know what direction to take, even though a career in power station was enticing. For some unknown reason or maybe the influence of school friends, I applied for a BSc degree in civil engineering at the Witwatersrand University. Shortly after I enrolled, I changed to mechanical engineering, a decision I knew was right, and for which I am forever grateful, as it opened a door for the career that followed. After my first year 1946 which I passed, I realised my parents could not afford to keep me there without considerable hardship. I worried over what would happen if I failed. This led to a decision to go and serve an apprenticeship as a fitter with the VFP in their maintenance department at Rosherville. I would return to university at a later stage, if I could through obtaining a bursary or some type of funding. I remember riding my bicycle at 6:30 am to Rosherville on my first day as an apprentice wondering what it was going to be like. On the journey I decided that I did not want to spend all my days as an artisan, but for now the task at hand was to learn the trade so that I could work as an artisan. At least I would have a fall back career with which I could make a living. I worked with top-class artisans and supervisors and I learnt a lot. I was not the greatest artisan, but tried my best at all times. I also realised the importance of the workshop in the company’s well-being and performance. I came into contact with typical examples of power plants, both mechanical and electrical, with which I would be associated in my career. I also learnt to work and associate with various types of personalities, from other apprentices to the senior supervisors in the workshops. This was a great learning curve, and my experience would help me tremendously later in my career, right up to the time of being chief executive of Eskom. I came to understand and, most important, relate to them, and hopefully they did to me. At one stage I worked in the locomotive section under a charge hand, Dave Parsons, a real character and an outstanding artisan, His love and care for ESCOM’s locomotives ensured that they were all running as new, until they were pensioned off. Once such loco was a Kitson, which was over 100 years old! I was playing soccer for the Germiston Callies soccer club at the time, and was mad about the game. One Tuesday afternoon Dave wanted me to work overtime in the smoke box of the Kitson. I said it was not possible as I had soccer practice. Dave did not care much about soccer practice, and ordered me to work. I jokingly said that I would slip away at about 4 pm, not for one moment thinking that he had a plan in mind to outsmart any scheme I may have had about getting out of work. I went into the smoke box with my tools and started my task, when suddenly the door slammed shut and I was locked in. Dave informed me he would open up when I had finished at about 6 pm, too late for practice. I cursed but then laughed when I realised that the wily old dog had outsmarted me. This was followed by some water. All of this was designed to make me very comfortable. I cursed some more and laughed some more. At six o’clock, the door opened and I was let out to the clapping of the whole loco crew. Dave loved to tell this story ad nauseam, especially later when I became chief executive of Eskom. It was somewhat ironic that my start was in Rosherville in the Central Maintenance Department, and my last contact with ESCOM in the electricity supply industry some 57 years later was as chairman and director of Rotek, of which the Central Maintenance Department had become a major component. During the fifth year of my apprenticeship I became quite ill. I developed a kidney problem – nephritis – and was in hospital for six weeks, and off work for three months. On my return to work, I applied for a bursary from the steel industry to continue my studies toward a BSc mechanical engineering degree at Wits. I failed to win the bursary – it went to one of their staff members. However, as part of my application, I had to obtain a reference from a senior person in ESCOM. For some reason this was passed on to Bill Fenwick, head of operations. Fortunately for me, he thought about what I was trying to do and persuaded ESCOM’s management to start a bursary scheme for apprentices and other students. I was the first recipient. I returned to Wits and started my second year in 1951. At this time, I still had six months to go to complete my apprenticeship, and no remission was ever given. I had to complete my five years during my holiday periods. This was quite tough, having to go back to the bench during university vacations. At the end of this period, I ended up with my dreams fulfilled. I was both a qualified artisan and had a BSc degree in mechanical engineering. It had been a long and tough road, but it proved to be a useful one. I received great support from my future wife Jess, who was prepared to go out only on Saturday evenings and Sundays. When I had my degree we became engaged, but I still had to complete a two-year pupillage so we had to wait a further two years before getting married. It was a long wait but it was worthwhile. We are now looking at 60 years of marriage and wonderful experiences together! During my two years if of pupillage, I spent time in various departments, and again learnt a lot about aspects of electricity supply. I also met other remarkable people working in ESCOM, with their different skills and experience. Another simple lesson about life was learnt when I was working over a weekend on the turbine repair team at Vierfontein power station. Jess and I had recently been married, and I was sent to work with a team carrying out turbine overhauls under “Sonny” Jackson at Vierfontein. I was only able to come home every second weekend, and that seemed like two months – so anxious was I to be at home. One Saturday afternoon I was sitting cleaning blades on stationary turbine diaphragms next to the “boss boy”, Big John, who had worked in this team for many years. I was feeling sorry for myself and quite glum, when I turned to him and said “John, don’t you get fed up with this job, especially when you’ve worked at it for so long? He smiled and replied. “It is my job, and I need a job to earn enough for my family. I must try at all time to do a good job and that makes me happy. No, I don’t get fed up with this job.” I suddenly felt very humble and realised I had received a very important message, one which I came to remember many times over the years. I now had to make decision on the direction of my career. It was clear it would be with ESCOM, but should it be in ESCOM’s engineering department or head office, or in operations, especially in generation? When I decided on the shift engineer at Wilge power station. I asked instead for a position at Taaibos undergoing commissioning, but I had spent some time at Taaibos during my pupillage, so I was already known there, and I like the working atmosphere very much. This turned out to be a good decision. I never regretted serving a five-year period as an apprentice four years studying for a BSc degree, and a two-year pupillage. Throughout my career, I drew on this experience in various ways. I was always able, even as CE, to sit down on a toolbox in a workshop while in the field, and relate to the staff. They also knew that I had been there myself and understood the issues. It always felt as if we were part of the same team. ​​​Ian Campbell McRae was born on 24 September 1929 in Germiston. He attended Germiston High School from 1941 to 1945. From 1947 until 1951 he was an apprentice fitter and turner. Ian obtained a B.Sc (Mechanical Engineering) at the University of the Witwatersrand in 1953. In 1955 he successfully proposed marriage to Miss Jessie Scott, who was working for ESCOM Simmerpan for ten years and they were reluctant to release her to go to Taaibos. From 1955 he was a pupil engineer grade 2 at Rosherville and Taaibos power stations. He became the assistant resident engineer at Taaibos in 1957. In 1958 to 1960 he was promoted to Senior Assistant Resident Engineer at Highveld power station, and in 1960 to 1965 he was promoted to Resident Engineer at Komati power station. He then moved on as Assistant Generation Engineer (East) and in 1967 Generation Engineer (East). In 1967 to 1968 he was made Senior Assistant Generation Engineer (Ops) Head Office and went on to become Generation Engineer (Ops) until 1971. 1972 to 1976 Manager Central Generating Undertaking until 1976 and became Assistant Senior Manager (Operations) until 1980. He then became General Manager (Operations) and General Manager (Engineering) until 1984. 1985 he was made Deputy Senior General Manager and ultimately he became the first Chief Executive and Chairman of the Management Board. He has had an illustrious career in both Eskom and the South African member committee of the World Energy Council, and is the first person to have been given Honorary Vice-Presidency of SANEA in recognition of his major contribution over the years. In ESCOM he rose from being an apprentice fitter in 1947 to becoming the Chief Executive and Chairman of the Management Board in 1985. He was appointed Chairman of SANEA at the same time. He received many awards during his service to Eskom, amongst these (to mention but a few) the Engineering Newsmaker of the Year Award in 1988, an Honorary Doctorate in Engineering from the University of the Witwatersrand in 1989, the Business Statesman of the Year Award from the Harvard Business School Club of South Africa in 1991 and in 1993, the coveted Order for Meritorious Service Gold (OMSG), from the State President. These accolades were granted for the major role that he played in the development of improved living standards and upliftment of the people of South and Southern Africa. In his position of strength in Eskom, a major South African organisation, he made breakthroughs in parts of the continent and created opportunities for the exchange of information, knowledge and fundamental understanding of the needs in other countries and cultures. He took advantage of the "open doors" provided by the World Energy Council to influence positively and integrate with the WEC many Eskom initiatives during a time when South Africa was unaccepted in parts of the world. When Ian McRae retired from Eskom in 1994, he became Chairman of the National Electricity Regulator (NER), Chairman of the Southern African Development through Electricity (SAD-ELEC), Chairman of Rotek Industries and Honorary Vice-President of the South African National Energy Association. He is also Vice-Chairman of the WEC Administrative Committee. At a time when “sabotage” at Koeberg has recently been suggested in certain quarters, it is indeed enlightening to read the chapter entitled “Koeberg and other plant sabotage”, by the man who, as head of operations, was responsible for Eskom’s security at the time of an incident in 1982, where four limpet mines exploded in well-chosen areas within Koeberg, including the reactor head of Unit 2, at a cost of some R500-million. Similarly, the chapter entitled “Shortage of capacity” shows how many of today’s problems have been overcome in the past. The book covers the period from 1947, when he joined Eskom as an 18 year old apprentice fitter, to his retirement as chief executive in 1994. It also deals with his subsequent success in establishing the National Electricity Regulator (NER), where he served as its first chairman and CEO from 1994 to 1997. Dr. McRae’s long career in Eskom spanned the rapid growth of the company in the period 1950 – 1980, the downturn of the 1980 – 1990s, and social change in the late 1980s and early 1990s, where his role formed a valuable part of the Eskom legacy. This book is a valuable complement to “A Symphony of Power – the Eskom story” by Allen Morgan, who succeeded Dr. McRae as chief executive at Eskom. It gives first-hand insights into the once-mooted privatisation of Eskom, Dr. McRae’s “electricity-for-all” electrification initiative (the world’s biggest at the time), the establishment of the southern African power grid, the restoration of the Cahora Bassa HVDC scheme, and the Koeberg licensing issues. 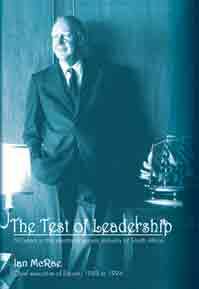 A key theme of the book is leadership, and in particular the kind of leadership Dr. McRae practiced at Eskom during its phases of both growth and then downsizing. This was essentially one of empowering people within a framework of a clear and inspiring vision. There is no doubt that his integrity, credibility, drive, inherent humility and care for people, also profoundly helped to motivate Eskom staff during many difficult times. In addition, his tenacity of purpose and commitment as a team player enabled Eskom to achieve its strategic goals in the late 1980s and early 1990s, and to survive unscathed through the political transition period of South Africa. His remarkable courage was revealed in his meetings with the ANC in 1988, his promotion of equal opportunity during the height of the apartheid era, and his legendary “electricity-for-all” electrification campaign. These initiatives, and others, helped Eskom pre-empt and adapt to the social changes of the 1990s. Dr. McRae brought great credit to Eskom and South Africa through his activities in the World Energy Council (WEC) and the World Association of Nuclear Operators (WANO). The leadership given to these organisations, together with his activities in SADC, are accurately and modestly described. The book is also about McRae the man – his strength and weaknesses, his sense of serving others and Eskom. This is thus the story of a person who has served his fellow man, his company and his country with distinction and humility, using his God-given skills of leadership. In several places in the book, Dr. McRae mentions how being a good mentor is one of the attributes of the outstanding leader. Having benefited himself from good mentorship, Dr. McRae helped to establish the strong culture of mentorship that exists in Eskom today. Dr. McRae deals objectively and generously with his relationships with his staff, colleagues and political masters named in the book, including his relationship with industrialist and businessman, John Maree, who was chairman of Eskom during these turbulent times. The book is well written and readable, and contains a good selection of historic pictures made possible by the author’s as well as the Eskom archives. The book encapsulates elements of the history of Eskom not previously revealed – insights into critical technical problems, business drivers, political pressures and strategic imperatives. The book will be fascinating to those who worked within or knew the Eskom of the McRae era. It is a unique chronicle of Eskom’s history, and overall, it is both uplifting and inspiring. The book has 180 pages, divided into 33 compact chapters, which contributes to its readability, and is published with hard cover and over 30 full colour pictures. The foreword is given by Reuel Khoza, chairman of Nedbank, and formerly chairman of Eskom at the time of Dr. McRae’s retirement. The book is available from EE Publishers and retails at R230, including VAT and postage within South Africa. Few Eskom employees can claim to have left footprints anywhere near as deep as those left by Ian McRae. His 47-year service record is bound to stay unrivalled for some time and it was fitting that he should become the utility’s first-ever CEO. It would be fair to say that McRae has Eskom in his blood, with his father also having served the company, in its previous guise as the VFP. He used to take the young Ian to the power stations at Simmerpan. After school, McRae went to study at university for a year, but his parents were unable to keep him there. Having some knowledge of his father’s employers, McRae applied to the VFP for an apprenticeship. He completed his fifth year and then applied for a bursary from Iscor, as they were the only ones advertising bursaries at the time. When he submitted his application to Eskom with a request for a recommendation, Eskom decided that they did not want to lose his talents and the utility decided to start awarding bursaries. McRae was one of the first recipients. McRae completed his university degree and a subsequent practical requirementse and from there decided that his future would be intertwined with that of Eskom. “My years as an apprentice in the workshop later proved to be of value on many occasions, even as CEO, not only in building relationships, but also in understanding the difficulties that the company may be facing,” says McRae. However, he was not destined to stay at the bottom rung of the utility for any extended period. In 1961 he was appointed as station manager of Komati power station, which was Eskom’s newest and largest power station at the time. His appointment at a rather youthful 31 years of age raised an eyebrow or two. “I never understood why I qualified for the position, but I got offered it and I accepted. The next big step came when I was appointed as the manager of the Central Generating Undertaking. At the time, Eskom was divided up into a number of undertakings. These undertakings were mainly involved in distribution, but some also had their own generation functions, such as Natal and the Cape, in addition to the Rand and Free State undertakings that had the most power stations. “Government then decided to bring all of these power stations together under the Central General Undertaking. I was then invited to lead this undertaking, which was going to be a big task, because the cultures in the various undertakings were vastly different. As a leader, McRae started to read up as much about the topic as possible and created visions for the positions that he held. McRae is one of the few people to have experienced Eskom during extended high growth and extended low growth periods. With the utility’s move to its new office at Megawatt Park and McRae’s promotion to head of operations in the early 70s, it was certainly in high growth mode. McRae then progressed to head of engineering before finally being appointed as the company’s first CEO in the early 80s. This was a difficult time for Eskom as it had just come through the second commission of enquiry, which had made certain recommendations and changes. The political situation also did little to help, with the country becoming increasingly isolated. In addition, the biggest act of corporate fraud in the country’s history had just been perpetrated by an Eskom employee who used the Nuclear Secrecy Act to transfer money to a personal Swiss account. As a result, the chief executive of the soon-to-be obsolete Electricity Supply Commission and the financial manager left their positions, which again led to McRae being appointed into a position of increased responsibility earlier than he would have expected. Again it was a surprise in a company that had been dominated by Afrikaners in the top positions. A new chairman – John Maree – entered the fold and he made it clear that Eskom would be moving from a strong growth phase to a non-growth phase to make it more viable financially. Together they developed the vision of turning Eskom into a top-performing company, with the knowledge that government would take over operating control if they were not successful. McRae, with his years of experience, was the perfect person to make Maree familiar with the intricacies of the Eskom culture. Together, they managed to turn around the perception of Eskom as a non-performing company. The next challenge that McRae identified was the electrification of the townships, because he knew that change would come and that it would soon become an Eskom imperative in any event. He therefore met in secret with many representatives of black communities to gather their input and compile a strong case for mass electrification. He even met with members of the very-much banned ANC at the time and took their answers to government, where the go-ahead for electrification was given. Although the board was concerned about the political implications, the go-ahead was eventually given to start electrification. As was his wont, McRae soon identified another threat and a vision to combat it. At the time, most of South Africa’s neighbours were quite hostile to it and having seen the redemptive power of electricity and its ability to bring people together, McRae started to develop the vision of an integrated southern African power grid. Because no countries were prepared to deal directly with the apartheid government, McRae had to find roundabout ways of getting the vision off the ground, such as relaying power from Mozambique’s Cahora Bassa generator via South Africa to the Zimbabwean grid. These moves heralded the start of Eskom’s cross-border collaborations and although they were pursued with varying levels of vigour after McRae’s time, he can still be rightfully proud of these efforts. He still believes that a southern African grid will be beneficial to both South Africa and the region. His message to current Eskom leaders is that generation, transmission and distribution has to be separated into separate companies for electricity supply to become truly efficient and to allow independent producers to play a role. "Eskom has a wonderful base which has been created over the years by real captains of the industry making, people who were bold in their decision making, people who were dedicated. South Africa can look forward to developing an industry of the future based on the past of Eskom. This applies not only South Africa, but the rest of Africa as well, particularly Sub-Saharan Africa. It has been a challenging past and it is going to be a challenging future. And I just feel so personally honoured to have been able to be a part of that." Ian McRae was awarded an Honorary Doctorate in Engineering for his outstanding contribution to industry at the Faculty of Engineering's graduation ceremony at Wits University. He received the honorary degree in recognition of his efforts in the economic upliftment of South Africa and its neighbouring states and the improvement of the quality of life for the people of South Africa. Ian McRae devoted more than 40 years to Eskom, starting as an apprentice fitter in 1947. He rose steadily through the ranks and has been closely involved with many important areas of development, particularly in the field of power generation. He is one of the foremost business leaders in the country and was nominated by the Sunday Times Business Times as one of the top five businessmen of 1989. Presenting McRae for the honorary degree, Prof David Glasser, Dean of the Faculty of Engineering said: "McRae has a vivid vision that Southern Africa can become a growth centre of the world and that electricity has the potential to provide the platform for the economic upliftment of not only South Africa but also its neighbouring states. "To achieve this, he is ignoring the current political constrains and the resistance to the idea of economic cooperation with states to the north of our borders," said Prof Glasser. "He is using his engineering back ground his managerial and negotiating talents and the infrastructure available to him at Eskom to clear the way towards and integrated subcontinental power grid". Prof Glasser added that under McRae's leadership, Eskom was moving aggressively toward achieving the target of providing all South Africans with electricity. "McRae is an engineer who is continually championing new, innovative approaches to attain this end."